Avatar photo – hover your mouse on avatar and click on it. Click “Upload new photo”, choose the picture and save it. Cover photo of profile – click on camera icon in bottom right corner of Cover image. 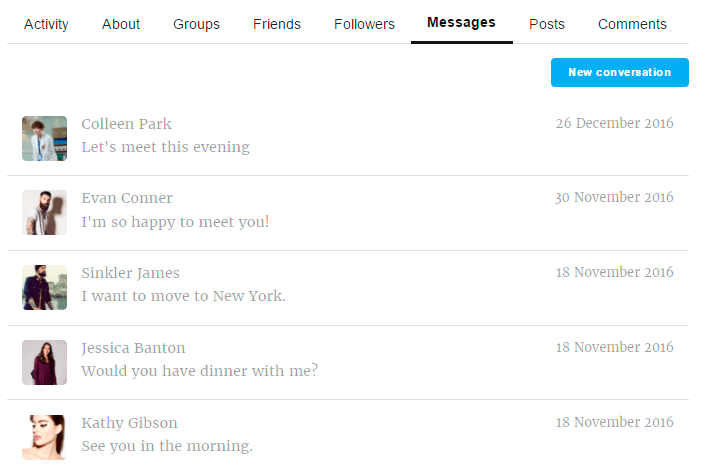 Profile page includes such sections – Activity, About, Groups, Friends, Followers, Messages, Posts, Comments and Settings. Also on this page user will be able to Logout from his personal account. Let’s check each tab in more details. 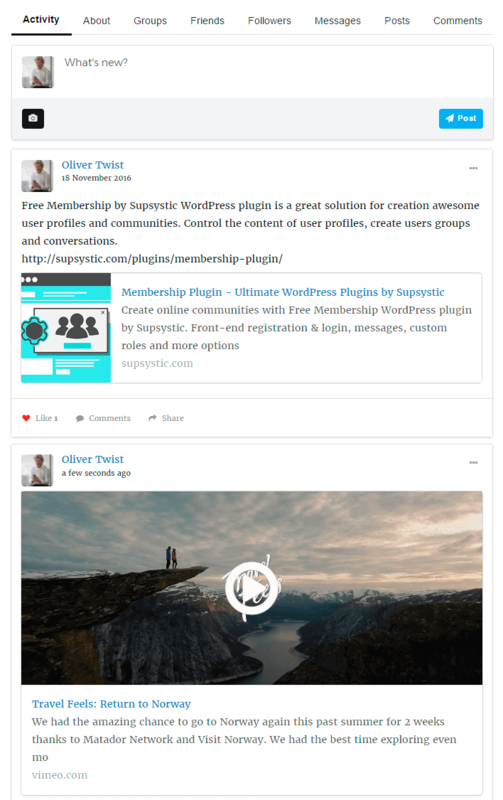 On this tab will be shown the list of all your WordPress posts. All posts with your authorship. Comments tab contains the list of posts where you have left the reply. Also this tab will show the text of your comments. 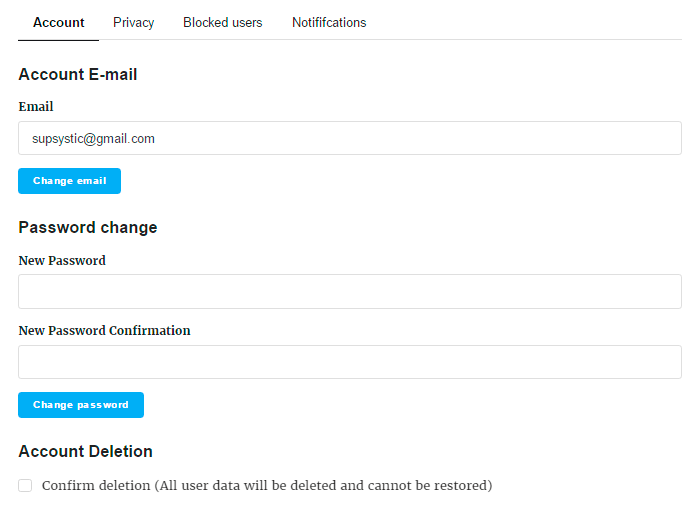 Account – here you can change your profile email and password. And also delete the account. 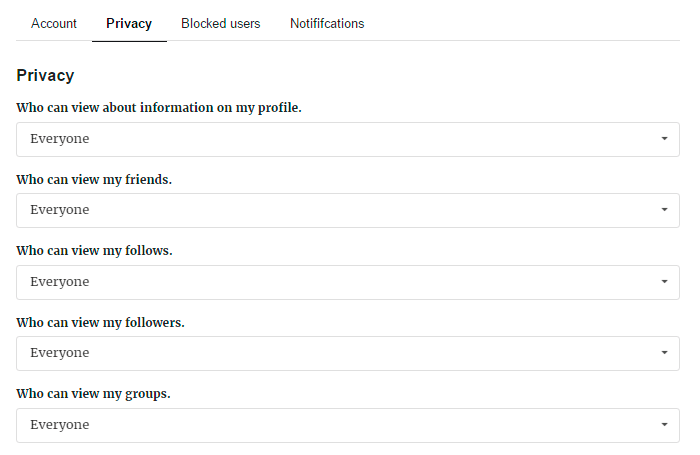 Privacy – set the privacy settings of your profile page for another users. 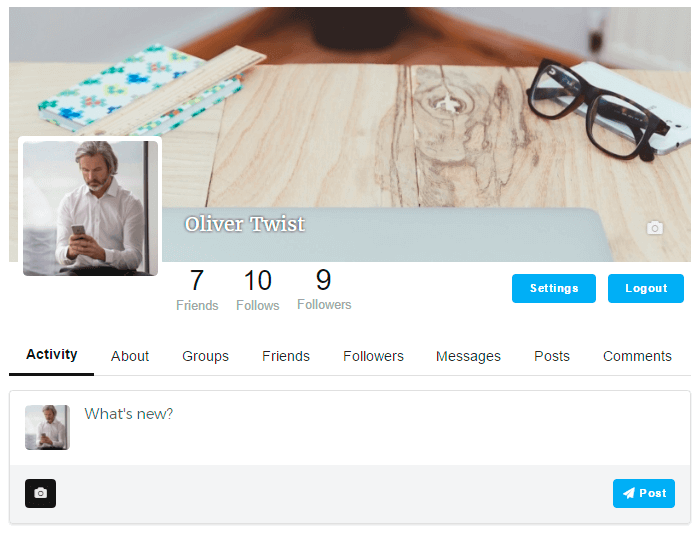 Here you can specify the limitations on different actions with your profile page for different users. Who can view about information on my profile. Who can view my friends. Who can view my follows. Who can view my followers. 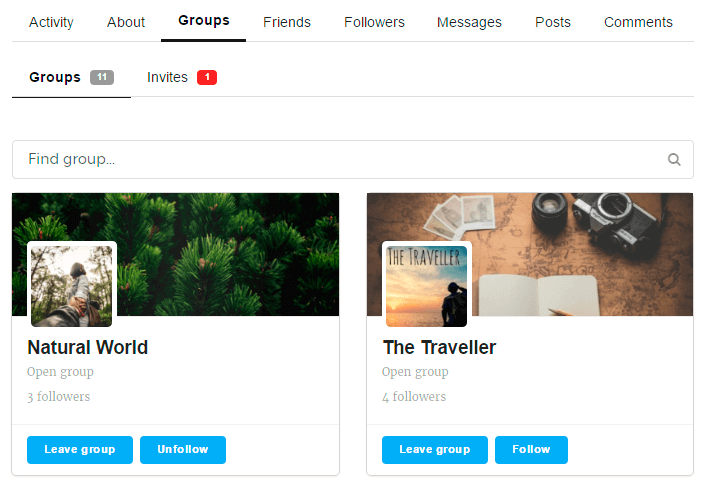 Who can view my groups. Who can post to my activity. Who can view my posts. Who can view comments on my post. Who can comment on my posts. 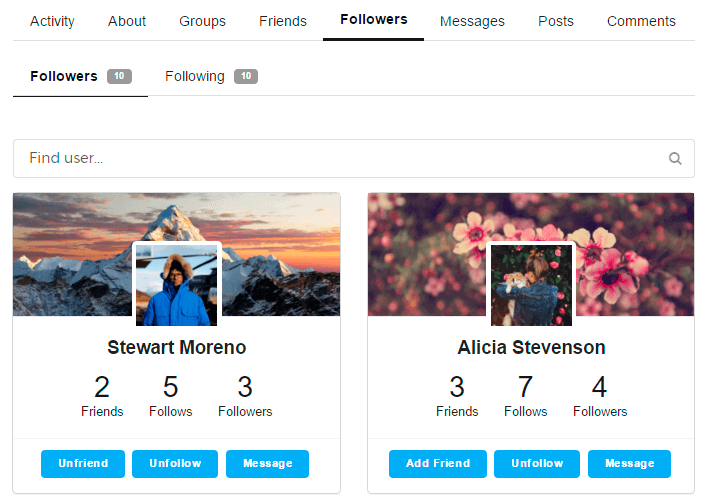 By default, user profile is fully available for all users. 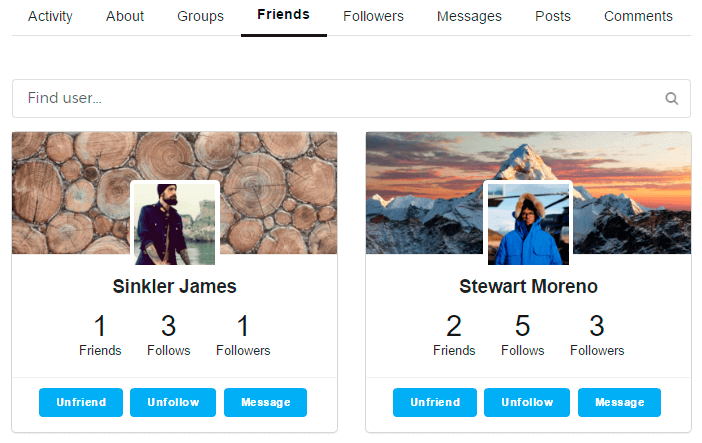 Blocked users – check the list of blocked users. Notifications – enable notifications about different activity of your Membership profile.